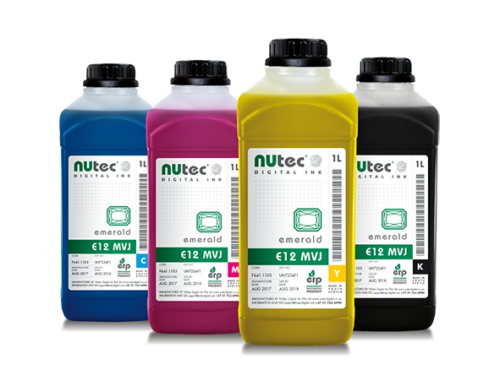 Emerald E12-MVJ is an Environment Responsible Product (ERP) solvent ink designed as a back-to-back replacement for Roland® Eco SolMax ink and is optimised for the Mutoh Valuejet® series printers. It provides excellent media compatibility across a broad range of self-adhesive and flexible substrates. Emerald E12-MS21 is an Environment Responsible Product (ERP) solvent ink designed as a back-to-back replacement for Mimaki® SS21™ ink. It provides excellent media compatibility across a broad range of self-adhesive and flexible substrates. Emerald E12-ESM2 is an Environment Responsible Product (ERP) solvent ink designed as a back to back replacement for Roland® Eco SolMax2™ ink. It provides excellent media compatibility across a broad range of self-adhesive and flexible substrates. Emerald E12-ESM is an Environment Responsible Product (ERP) solvent ink designed as a back-to-back replacement for Roland® Eco Sol Max™ ink. It provides excellent media compatibility across a broad range of self-adhesive and flexible substrates. Emerald E12 is a premium, Environment Responsible Product (ERP) solvent ink designed for use in Epson® print heads, as used in printers such as Roland® RS640 and XC540. It provides excellent media compatibility across a broad range of self-adhesive and flexible substrates.